Horses for courses. As a socially acceptable fun car the Fiat 500C is hard to beat. The weather of the last few weeks may not have promoted spring but in truth it is not far away and with it thoughts of open top motoring. The trouble is that the selection of convertibles offered is very small, and mostly expensive writes Malcolm Ginsberg. And there is of course the Fiat 500. It will cost you a great deal less and arguably is just as pleasurable. It is a 2+2 as well. That is what the smart people drive! 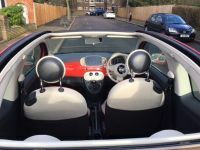 BTN has been trying the 500C, the cabrio version with an electric roof that folds down over the rear, not quite a proper drophead, but much more of an open car than one with just a sliding sun roof. The roof is a two-piece unit with the electric buttons and you can use with just the front panel retracted. At the back there is a proper glass window, not a plastic item that used to be the norm. It does not go all the way down and rather like the Mini convertible the view is restricted in that mode. And comparisons with the Mini need to be made, its one-time competitor failing to stay small and slim and gaining a middle age paunch. The Fiat 500 is still what it was on the day it was launched. A zippy fun car that feels quick, even if it is not. Don’t just think of the little Fiat as a city motor, which in fact it is, but during the week the little two door car was in our procession it was also used for a 360 mile day trip from London to Cleethorpes and back. Not tiring at all and 45 miles per gallon. Once again the manufacturer’s figures and real life do not match. 60 mpg it is not. The Fiat has a realistic range of 300 miles with a 7.6 gallon tank. Translated this means 6.3 litres per 100km with 35 litres topped up. The Italian has been around since 1957 but was completely re-engineered in 2007, and in 2017 passed the two million build mark. Available is a limited-edition Fiat 500 Anniversario introducing colours and shades that recall the past. It's a tiny car so space is at a premium. No problem for those in the front seats who have adequate space but don’t expect a rush to struggle into the rear. Once seated it is OK and ideal for children, but adults of any size will find it a bit of a strain for any longish journey. To be fair it was not what the car was built for. There are two cupholders up front and another pair between the front seats to take the total to four, neatly matching the passenger count. There's a little slot for a phone ahead of the front cupholders and a springy-netted pocket on the driver's side of the console, again not a bad spot for a phone. The boot is tiny (182 litres) and has a small opening, so only carefully packed shopping will fit in. But suitcases can go easily onto the back seat which are slit and also fold down. The interior has been steadily improved over the years, but for a certain generation the front panel looks and not too appealing. The MultiAir 1.2 litre engine is one of the best of its class but still struggles with a 0-60 in 12.6 seconds and a real buzz which makes it feel faster than it actually is. A five-speed box is nice and crisp and adds to the sporting tone. The test car came with a host of useful extras which does add to the cost. This car did not bounce about as much as a previous Fiat 500 test car which must be down to the larger 16in wheels fitted. The rear windows were dark tinted and the Bi-xenon headlights proved their worth in the long drive back from Humberside. Automatic Climate Control, DAB radio, TomTom Navigation and 7in TFT screen completed the add-ons. For whatever reasons the Italians still have not offered a rear-view camera on the car. OK it does have sensors but they need to pick up something, which is not always the case. Seeing what’s behind you is much more sensible, and likewise door mirrors that electrically fold back when the car is vacated and locked should be an option. 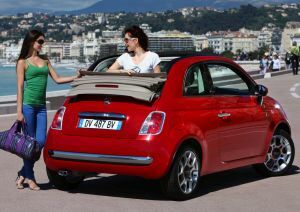 The whole concept of the Fiat 500 is a tiny vehicle that can be parked in the tightest of spaces in town. You need every aid to make the best use. Fiat provides a three-year/150,000km warranty along with roadside assist for three years.